On my return from my last trip to America, my pastor, the Rev. S.F. Collier, remarked to me that the position I ought to fill was that of recognised Free Church evangelist. He said that he intended to suggest this to some leaders of the National Free Church Council. Dr. Pope met me one day in Manchester and made the same remark. Not long after these conversations, I received a letter from the Rev. Thomas Law, the General Secretary of the National Council, asking me to meet him at the Central Hall, Manchester. I believe that Mr. Law had developed in his own mind and had suggested to the committee a great scheme of evangelism to be undertaken by the National Council and that, in this connection, his thoughts had been turned towards me. I did not gather from this first interview that Mr. Law at that time was empowered to invite me to become the Free Church missioner. I understood that he merely desired to ascertain my views on the matter. I agreed with him that official connection with the National Free Church Council would certainly be a great strength to me, and would open up to me a wider field. I talked the matter over with my wife, and she advised me to accept the position if it was offered me. I had not sought it. It had come to me. At a second interview with Mr. Law I consented to become the National Council's missioner. It was arranged that I should begin work on the 1st of September, 1897. I have now been in the service of the National Council for over four years, and all being well, I hope to end my days as their missioner. I consider my present sphere of operations the biggest and most important field I have ever touched. When it is properly worked it will do more to break down local prejudices and to bring Christians and Churches together than anything has done for ages. I owe a debt of gratitude to Mr. Law for the wisdom and discretion he has displayed in arranging my missions at centres which give me the best opportunity, and also for his kind thought and care for my health and comfort. Between my engagement and the commencement of my work for the National Council, there was an incident in my life of which I am particularly proud. In 1897, the Wesleyan Methodist Conference was held in Leeds, and I took two Conference appointments - preaching in the Colosseum twice on Sunday to over 6,000 people. I believe that I have the distinction of being the only layman who has ever taken a Conference appointment. When the official plan was first published, my name was omitted. As I had hesitated to accept the invitation of the Rev. S. Chadwick to preach these discourses, I concluded, when the plan came out without my name, that he had managed to do without me. I wrote to Mr. Chadwick to that effect. He wired back that I was advertised all over Leeds. The explanation of the omission was that, a layman never having taken a Conference appointment before, the Plan Committee did not know whether they ought to announce the fact, and thought the safest thing was to take no notice of the lay evangelist. There was a short debate at the Conference on this matter, in which Mr. Chadwick, Mr. Price Hughes, and Mr. Watkinson, pointing out the absurdity of the omission, took part. Their conclusive argument was that if a man was fit to preach, he was fit to be announced. I could write a volume about my work for the National Free Church Council. It has been greatly blessed, and it is full of interesting and encouraging incidents. Let me tell a few anecdotes. When I was conducting a mission at Lancaster I overheard two men discussing my career. One of them was somewhat deaf, and like most deaf people, spoke very loud. My life story according to this deaf man was this: "When Gipsy Smith was a little chap - quite a kid, you know - they sold him to a rich old bloke with plenty of brass. This old chap was religious-like, taught the Gipsy to read the Bible and be good, you know; and then the old chap died and left the Gipsy all his money - plenty of brass! Oh, lots of brass! Then Gipsy took to preaching, and they called him 'Gipsy Smith,' because he was a gipsy when he was a kid. He is a splendid preacher. He preaches just for the love of it. He need not do it. He has plenty of brass; the old chap left him such a lot. Now, that's the man. I am going to hear him." When I appeared before my congregation in the evening, I saw this man and his wife sitting immediately in front of me. I told the people the story of my career that I had overheard. The author of this strange romance listened with his mouth wide open. I said, "That story is not true, and if you will come to this church on Monday night, you shall hear the true story." The man and his wife were converted during this mission. My wife and I, with some friends, were spending a week at the seaside. I had wandered a little bit away from them. An Italian girl, who made her living by singing and playing to the people, evidently mistook me for a countryman of hers. I was dressed in a velvet jacket and beaver hat. She began to talk to me in what I took to be Italian. I told her that I was not an Italian, but a gipsy, and that she must speak in English. Presently my wife came up to me, and the Italian girl said to her, "You go away; this is my young man." I explained to my new sweetheart that the lady she was sending away was my wife. In broken English, she asked Mrs. Smith the same questions she had put to me, whether I had been brought up in a tent, lived in the woods, and run wild? She replied, "Yes." Then said the Italian girl, "Where did you catch him?" I asked a number of Sunday-school children one day what a gipsy was. A little boy replied: "A man who goes round and round and round to see what he can find." Not at all a bad definition of many gipsies. A pretty incident occurred during my mission in Cheltenham. A sweet, beautiful young lady, who was converted one night, brought with her, two or three nights later, her dearest friend, a deaf and dumb girl. As my sermon proceeded I saw the new convert interpreting to her friend what I was saying. This deaf and dumb girl was the first person to rise for prayer. Presently the two went into the inquiry-room. "Will you please help my friend? She is seeking the Saviour," said the new convert. The inquirer being deaf and dumb, none of the workers was of any use, and so we told the young lady that she was the proper person to bring her friend to Christ. The two went away happy in their Saviour. It was during a mission at Taunton that I learnt the hymn "Count your blessings," which through its use at my services has become exceedingly popular in many parts of England. At the request of Mr. Tom Penny, my host, I visited the Infirmary. Most of the patients had been carried out on to the lawn for a sun bath. I spoke a few words to them, and then Mr. Penny said: "Before Mr. Smith goes, won't you sing something for him?" "Yes, sir," said a little girl. "What will you sing?" said he. "Count your blessings," was the reply. Immediately I was deeply touched and impressed. Here was I in full enjoyment of health and of many priceless benefits of God, yet I had never counted my blessings - it had never occurred to me so to do. I felt sure that thousands of others had been guilty of the same omission. I reflected that the Psalmist must have been thinking of this disposition of our hearts when he sang, "Forget not all His benefits." Many of us, alas I are never so happy as when we are talking about our miseries. The sweet song fastened itself upon my heart and soul. I sing it at my meetings very frequently. The hymn attained extraordinary vogue during my mission campaign at the Metropolitan Tabernacle. Wherever one might go - in the streets, in the trains, in the trains - some one was humming or whistling or singing, "Count your blessings." The boys pushing their barrows along, the men driving their horses, and the women rocking their cradles - all these had been caught by the truth and melody of the hymn. My last mission for the nineteenth century was conducted at Luton. The inquirers numbered 1,080, rather more than one in every forty of the population. Rev. W. Henry Thompson, the Wesleyan minister of the town, and the chairman of the district, said to me that the people in Luton never ask "Where are the new converts?" They have no need to put the question. The new converts are everywhere - in the Sunday services, the week-night services, and Christian Endeavour meetings. Said Mr. Thompson to me, "I have never been connected with a revival which left such a genuine crop of new converts as yours." As I have said elsewhere, to me the most memorable incident of this mission was the restoration of my sister, Lovinia (Mrs. Oakley), who had been a backslider for years. Her health has not been good, and a week or two ago I visited her. I told her I was going to put her into my book. She said "Yes, all right; tell your readers I am holding out, and that I may soon be in the presence of my Lord. I do not fear the great day. I have placed my trust in Jesus Christ." During the mission at Luton, my brother-in-law, Mr. Evens, was sent for to conduct the overflow meetings. On the Saturday I took him to the place of my mother's death and burial - at Baldock, about twenty miles off. I pointed out to him almost the exact spot in Norton Lane where she lay sick unto death, and together we trod the path along which her coffin must have been carried to the grave, with my father following, as the sole mourner. When we stood by the grave, I said to my brother-in-law, "I have been feeling for some time that I should erect a stone here." "I am rather surprised," he answered, "that you have not done so before." "Yes, indeed, but I have made up my mind to do it now." Alderman Giddings, the Mayor of Luton, presided at my lecture on the Monday evening. When I reached the part where I tell of the death and burial of my mother, he turned to Mr. Evens, who was sitting beside him on the platform, and asked, "Is there a stone over that grave?" "No," he replied. "Well, I will put one up; that is my business." At the close of the meeting he told me of his decision. The incident seemed to me a remarkable comment on the text: "Before ye call I will answer. While ye are yet speaking I will hear." The opening weeks of the twentieth century were made for ever memorable in the history of the Evangelical Free Churches of England by the Simultaneous Mission. From the beginning of the Federation in movement - a movement which commands the support of all the leaders in the Free Evangelical Churches of England and Wales, and has succeeded in welding these Churches together into one mighty army - evangelistic work has had a prominent, and indeed a foremost place. Most of the local Councils, which now number nearly eight hundred, have at one time or another held united missions with conspicuous success. It occurred to the Rev. Thomas Law, the General Secretary of the National Council, that no better way of inaugurating the new century could be devised than that these Councils should at the same time be engaged in an earnest endeavour to reach the masses outside the Churches. It was impossible to conduct the campaign with literal simultaneity. The work in London extended from January 26th to February 6th; in the provinces, from February 16th to February 26th; and in the villages from March 2nd to 6th. This great enterprise was crowned with the richest spiritual blessing. I worked at the Metropolitan Tabernacle during the London campaign. The vast building was crowded at every service, and more than 1,200 persons passed through the inquiry-rooms. I had the great joy of my father's presence with me every night. Mr. William Chivers, whose mother bought clothes-pegs from me when I was a boy, brought my father from Cambridge to London with him as his guest, and entertained him during the week. Several other relatives came up to that mission. Some aunts and cousins that I had not seen for twenty years or more. My father was in his element. It was the crowning experience of his life. Mr. Meyer afterwards said that it was beautiful to witness on the old man's face the exact correspondence of sympathy with the emotions that filled the heart of the younger man as he proceeded with his discourse. It was hard to tell which the sermon cost more, the father or the son. One night as we two got into a cab, my father was full of uncontrollable joy. Jumping up, he said, " I tell you, my dear, I seemed to creep right into your waistcoat to-night." That was his vivid and characteristic way of expressing the perfection of his sympathy with me. My father, uninvited, assumed control of the inquiry-room workers at the Tabernacle, but so gracefully and sweetly did he do it that the workers quite willingly submitted to his direction, feeling that it was only what should be. The Rev. Thomas Spurgeon, the pastor of the Tabernacle, was present at nearly every service, and a few days after the mission he wrote the following notes about it: - " From the outset Gipsy Smith secured the ear of the people, and soon he had the joy of winning their hearts for Christ. He emphasised the need of repentance, and the necessity for the new birth. He denounced every form of evil, and warned men to flee from the wrath to come. He preached a full and free salvation, and illustrated all with thrilling incidents culled largely from his own wonderful experience. It was evident at each service that he had spoken to good purpose. The demonstration of the Spirit was never lacking. No sooner was the address over than scores were ready to testify as to their desire to be saved, and to respond to a singularly persuasive appeal to 'come along' into the inquiry-rooms. One friend, who has been in the thick of many such movements, assures me that better work was never done before, so evident was the breaking down, and so manifest the breaking in of the marvellous light. We were all constrained to say, "This is the finger of God." 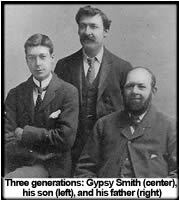 Writing in October, 1901, Mr. Spurgeon said - "Converts resulting from Gipsy Smith's mission are still appearing and asking to be united with God's people. Those who have already joined us seem to be of the right sort, and these later applicants are bright examples of Christ's power to keep and save. Writing eight months after the mission, I can only confirm my original verdict of it - full of real power and blessing." "I shall never forget one evening when the father of the evangelist was present on the platform, and seemed to be adding the force of his own devout, fervent spirit with every word uttered by his son. Our beloved friend enjoyed unusual liberty that night. It seemed as though the fragrance and music of his own early life were being wafted like a fresh breeze to the audience, which alternately was melted in tears or stirred to enthusiasm. "We are still continually hearing of blessing which was not recorded at the time, and the Secretary tells me that he has received many satisfactory reports from clergymen and ministers of the neighbourhood of the cases handed over to their care. It is believed that nearly every Church in the locality received some new converts, whilst the quickened life of many Christians testifies to the benefit they received. "It is interesting to see the evangelical nature of our friend's spirit and work. He attracts around him ministers of all denominations, and even Christians of the Established Church are drawn to him. God has greatly gifted him, and we can only believe and pray that he may be spared for many years, like a stalwart reaper, to go through the harvest field of the Churches, gathering in myriads of souls." This seems a fitting place to say that my missions in London in connection with the National Council have all been blessed with gratifying success. Perhaps the two most notable were those at Marylebone and Paddington. Dr. Monro Gibson contributed an account of the former to the British Weekly, from which I may make the following extract: "There is a charm about Gipsy Smith's personality which wins from the outset, and prepares for that response to his earnest appeals which has been marked in every service. He is more expository than any other evangelist whom I have heard, and neither his exegesis nor his theology would do discredit to a graduate of our theological schools. There is an air of culture even in style which is nothing less than marvellous to those who know the story of his life, and of which I cannot give any other explanation than that he is a graduate of the same school which prepared John, the fisherman, for his literary work. But the great factor is the power from on high with which he speaks, and which, manifest the first evening, was increasingly so as the days passed on. There has been much quickening among Christians, and a goodly number giving evidence of having been turned from darkness to light." Dr. Clifford gave his impressions of the Paddington mission in a long article published in the Christian World. "It has been a most helpful time," said Dr. Clifford; "there is not a Church in the Council that has not been represented among the visitors in the inquiry-room. Members and ministers thankfully testify to the quickening they have received. The message of the evangelist goes straight to the heart of the Gospel, and his methods are as sane as his Gospel is clear. He has no fads. He is not the victim of vagaries. He does not air any visionary theories. He knows his work and does it. He does not quarrel with pastors and call it preaching the Gospel. He is their helper. Exhaustless resources of pathos are his. There is a tear in his voice. He moves the heart of his audience to its utmost depths. But he never forgets that man has an intellect, and thinks and reasons and when the hearer is most roused to cross the Rubicon he holds him in thought as to the meaning of the step he is taking, tells him that going into the inquiry-room - important as that is as a definite and distinct choice of discipleship to Christ - is only a beginning, and must be followed by a resolute, patient, and thoroughgoing obedience to Christ, the newly-accepted Master. His humour is irresistible. It is one of his sources of power, for humour is human. It is one of the elemental forces of life, and it never fails to attract. He suffers no conventions to stand between him and it. He despises conventionality, and is as incapable of dullness as he is of obscurity. Every hearer sees what he is aiming at, and knows and feels that he is seeking the highest good. Hardly for a moment does he seem to lose touch of God or of his audience, and after a broad flash of humour instantly swings back into a direct and searching appeal, or else ascends in prayer not less direct and still more earnest. "The ethical rings out in his teaching with terrible resonance. Most of his strength is derived from the directness of his appeals to the conscience. He searches the heart, exposes the subtle devices with which we shirk our responsibilities as Christians, and compels us secretly to admit, if not to confess, our sins. The value of the mission to the avowed disciples of Christ is not less than to those who are constrained to make the great decision." I worked at Birmingham during the provincial campaign of the Simultaneous Mission. Alderman Edwards, the Lord Mayor, who is a prominent Congregationalist, postponed the mayoral banquet in order that it should not interfere with the mission and appeared by my side as often as possible. I was greatly helped by the best choir (conducted by Mr. Thomas Facer) and by the strongest band of workers and stewards that I have ever had anywhere. The Town Hall was crowded every evening; indeed, sometimes we could have filled it thrice over. Dr. Clifford, my colleague in this campaign - and no better colleague could a man have - delivered a series of noonday addresses on "Be ye reconciled unto God," which made a profound impression. His meetings were attended by from 1,000 to 1,500 people. When the last lecture was delivered, I was moved to propose a vote of thanks to Dr. Clifford, and to urge that the discourses should be published. At the evening service Dr. Clifford sat by my side, except when he was conducting overflow meetings in Carrs Lane Chapel. I felt in every service that he was praying for me and supporting me by his deepest sympathy. One night the first three rows in the Town Hall were filled entirely by men, and not one of them had a collar on. At the close they all went into the inquiry-room. As the mission proceeded the crowds grew. People came and stood two hours or more in the hope of getting in. The local papers stated that even Joseph Chamberlain could not draw such crowds as were attracted by Dr. Clifford and Gipsy Smith. On the second Sunday of the mission the people began to gather in the morning for the afternoon service. Five minutes after the doors were opened the place was crowded. There were more persons outside seeking admission than there were inside the Hall. Those who could not get in did not go away. They simply waited for the evening meeting, which was announced to start at seven. So large were the crowds that we began the service soon after five o'clock. Four policemen carried me into the hall over the heads of the people. An unaided attempt to force my way through the crowd was hopeless. Dr. Clifford was preaching that night at Carrs Lane. He had a rather curious experience. The policeman at the door refused him admission.
" I want to go in," said Dr. Clifford. "Are you a seat holder?" "Well, you cannot get in." "I think there will be room for me in the pulpit." " I am not so sure of it." "But I am Dr. Clifford; I am going to preach." "Oh, are you? I have let in two or three Dr. Cliffords already." In the end Dr. Clifford succeeded in establishing his identity to the satisfaction of the officers of the law, and was permitted to enter. One thousand five hundred persons passed through the inquiry-rooms during the mission. Rev. J.H. Jowett,. M.A., has kindly supplied me with the following note concerning the Birmingham campaign: - "Perhaps the most marked impression that remains in my mind, when I recall the great mission of last February, is the marvellous power of the Missioner's self-restraint. There was nothing of the 'scream' in the meetings. The sensational was entirely absent. I always felt that the leader was perfectly self-possessed, and that in his heart there dwelt the quietness which is the fruit of a steady faith in the Lord. In the final appeals the Missioner himself was overlooked in the mighty sense of the presence of God. The moving power was not so much a voice as an atmosphere. Hard hearts were melted in the constraint of an all - pervading spiritual power. It was not only the ignorant and uncultured who were won; those whose minds had received mental illumination were also wooed into the light of life. I have in my congregation young fellows of no mean ability who were led into definite decision for the Christ."